Before draining the lines of anti-freeze, connect both sink and shower drains gray water tote as you need to collect the anti-freeze for proper disposal. To sanitize the system we will add water and bleach at the rate of 1/4 cup of bleach to every 15 gallons and let it sit in the tanks lines and hoses for three to 12 hours. 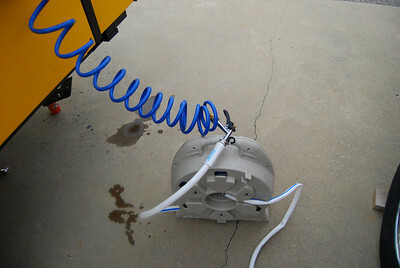 Locate your pump switch and turn on the pump. Start with the sink and turn on the hot water faucet until all the anitfreeze that has been in the line runs out, the fluid is completely clear and you can smell the bleach. Do the same for the cold water. 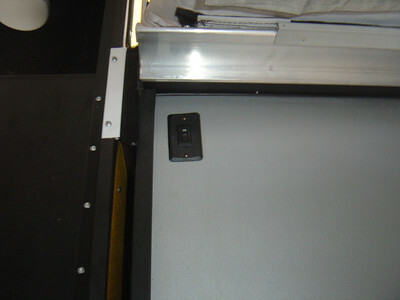 The goal is to drain the anti-freeze outr and to replace it by the dilute bleach solution. Repeat the same procedure for the shower. 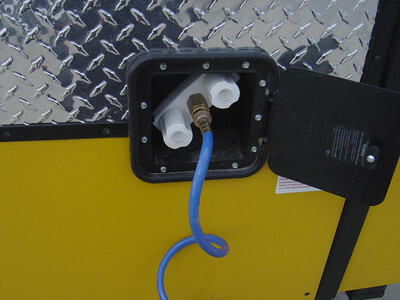 Finally, open both the hot and cold water faucets on the outside hose to drain out the anti-freeze and it is replaced with dilute bleach solution. 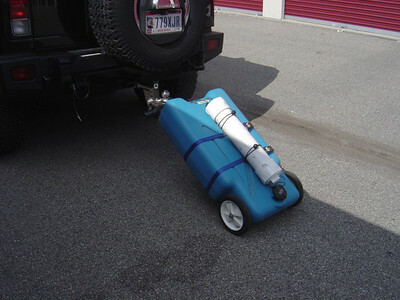 The Anti-freeze should be dumped into the gray water tote and disposed of appropriately. At this point all the anti-freeze should be out of the lines. 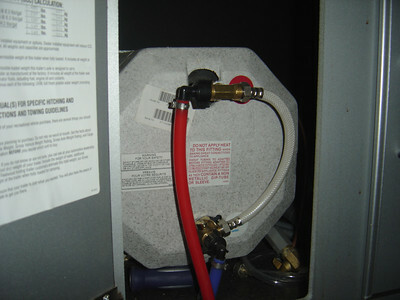 Go into the PUP, open the access way to the water heater and look for the bypass valve. 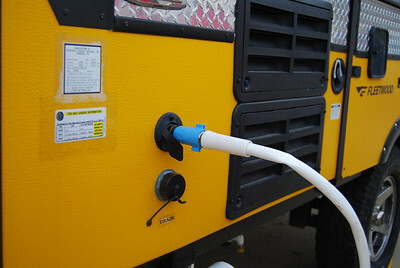 Turn it so that the dilute bleach water can now enter the the heater. 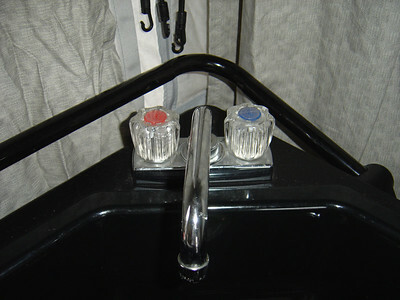 Turn on the hot water faucet which will allow the water heater to fill up with dilute bleach water. 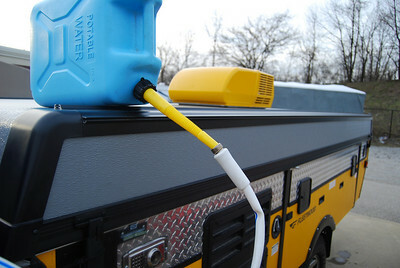 The final stage is to sanitize your water hoses. 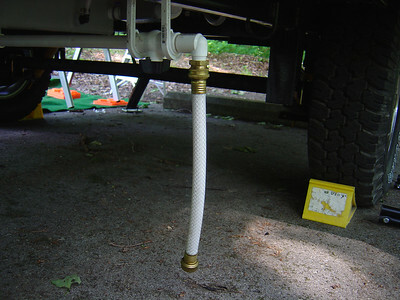 You can pour a dilute solution of water and bleach into the hose. 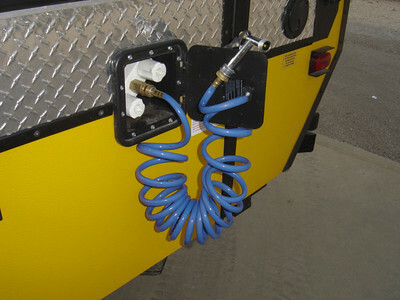 Alternatively you can connect the water hose to the out side PUP hose and fill the water hose with the dilute bleach solution. 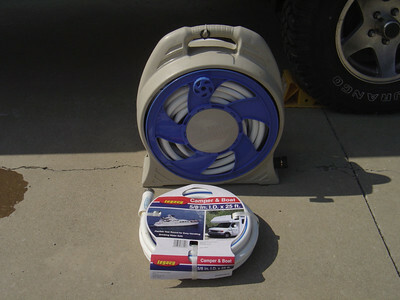 Connect both ends of the water hose together for 12 to 24 hours and then drain the hose. Dispose the antifreeze solution that drained from the PUP into the gray water tote. 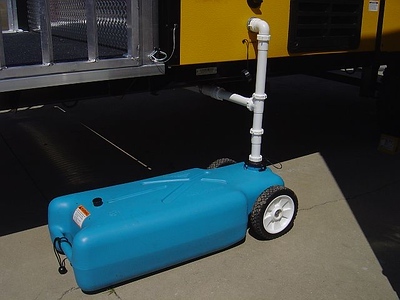 You can drain it into the wastewter sewer at your home, so that it goes to a water treatment facility for treatment. After 12 to 24 hours drain any remaining dilute bleach solution from the water tank. This water can be drained unto the ground. 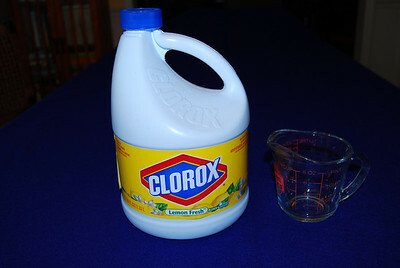 Turn on both the hot and cold water faucets and flush out the dilute bleach solution. Repeat the same for the shower. 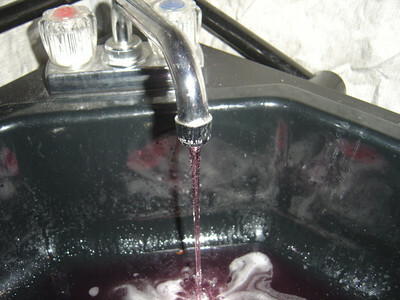 Turn on both the hot and cold water faucets and flush out the dilute bleach solution.